Author Freedom ARCPosted on Friday 13 September 2013 Thursday 15 November 2018 Categories Kingdom RealmsTags authority, heavenly encounters, intimacy, Kingdom of God10 Comments on 102. Investiture, Succession, Enthronement, Coronation. If you will walk in My ways and if you will perform My laws, then you will also govern My house and also have charge of My courts, and I will grant you free access among these who are standing here’ (Zech 3:7). Isaiah saw the Lord on His throne. The whole earth is full of His glory.” (Isa 6:1-3). So the Lord sits on His throne, on top of His mountain. And the structure of it is like the temple. There are seraphim who stand above Him (we will look at the angelic realms in more detail in a later post). They are prophesying the revelation they are receiving: that the earth is to be full of God’s glory. And God has chosen the church, He has chosen us, to display the fullness of His glory on the earth. The temple consists of the Outer and Inner Courts, the Holy Place and the Holy of Holies. The veils (or matrices) between the different heavenly dimensions are the way, the truth, and the life. In the Outer Courts there is darkness. If we don’t want to spend eternity there, we must seek to fulfil our purpose and our call. This is where we will find those who are not faithful to fulfil what is written on their scroll and the destiny they have been given in God. We have looked at that before: those such as the five foolish virgins, and those who say ‘Lord, Lord, did we not prophesy in Your name, and in Your name cast out demons, and in Your name perform many miracles?’ to whom Jesus says ‘Depart from Me, I never knew you’; they will be thrown out into the outer darkness. It is not the place we think of as ‘hell’ – how could a place of fire be dark? When Jesus described Himself as ‘the Way, the Truth and the Life’, He was referring to the pattern of the heavenly and earthly tabernacle, and specifically to the doors or veils between the various areas or dimensions. To those who were listening to Him it was perfectly clear what He was talking about, because they were familiar with those areas of the temple. He was saying that if we follow Him, we can enter in to the holiest place, and find abundance of life. Of course, if we approach this saying with a Greek mindset rather than a Hebrew one, the meaning will be completely lost on us. There is a process to this, a progression, a series of protocols that God has prepared for us to enable us to enter in. Let’s look at this diagram again. Most of the enemy activity that we are experiencing and trying to deal with right now is going on in the atmosphere of the earth. 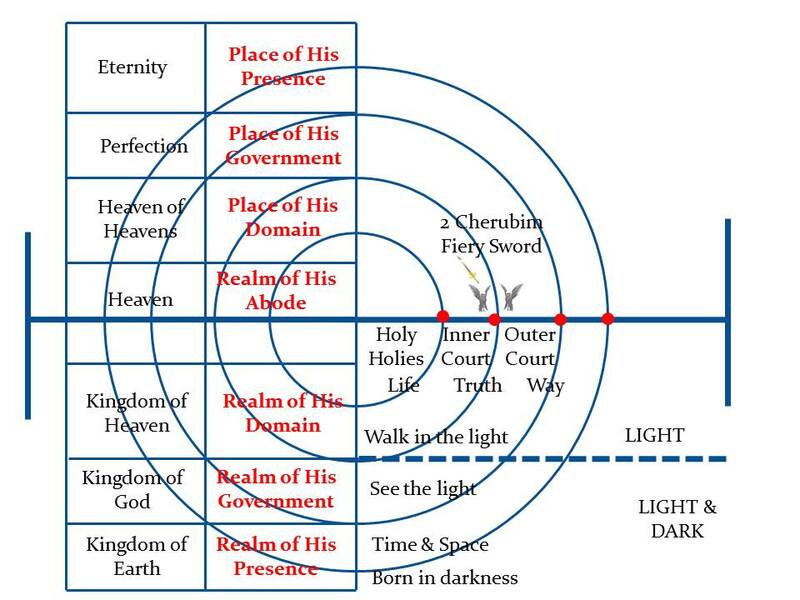 That is where the spiritual hosts of wickedness, the rulers in darkness, and powers are functioning in principalities (or spheres of geographical areas). The pattern that is in heaven is expressed in us. We are made in the image of God. We are body, soul and spirit. And in us we also have a door into the realms of the heavens, which we can open and experience the kingdom of God in us. In the same way, there are also Everlasting Doors on the boundary between the atmosphere of the earth and the heavens. We read about them in verses 7 and 9 of Psalm 24. Those doors are ruled by things we need to dispossess. I have seen God open some of these doors, often as a result of prayer and of intercession. When they are opened, revival starts to take place. God’s Presence and His glory become accessible in this earthly realm. Click the image for a larger, easier to read version (opens in new tab or window). In the realm of the Kingdom of Earth is where we ‘walk in His ways’ (Zech 3:6-7). In the Kingdom of God is where we ‘keep His laws’, and where we are to rule as lords. 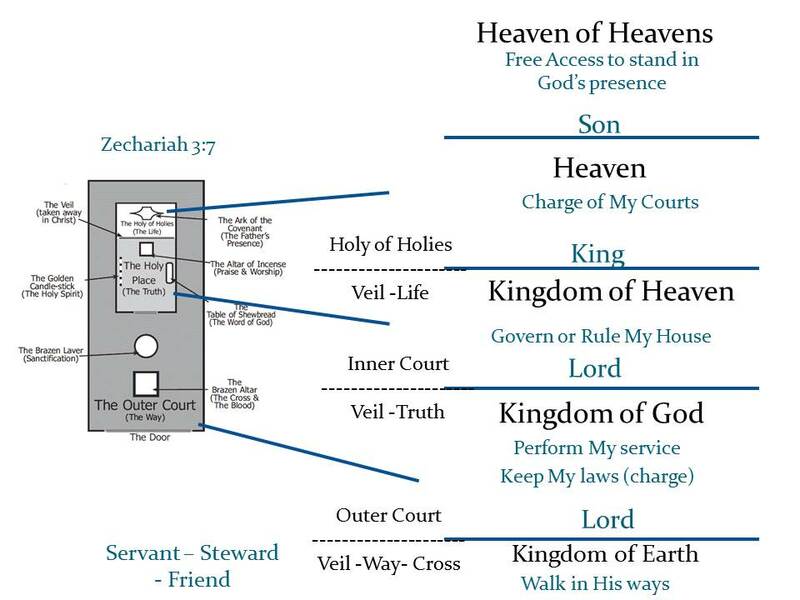 In the realm of the Kingdom of Heaven is where we ‘rule His house’. There are mountains and thrones in each of those realms, on which God intends us to rule. For example, in the Kingdom of God, we at Freedom have seven mountains as a church, and seven scrolls attached to those mountains. Other churches will have their mountains and scrolls too. Each of us as individuals also have our own mountains, our own places of rule. These are according to our destiny, our call and our gift, and we are to occupy them as lords. Jesus is King of kings and Lord of lords: we are the lords and kings that He is Lord and King of. As lords and kings, we raise people up in discipleship to themselves become lords and kings. The seven spirits of God stand before the throne in the realm of Heaven. They are not God, they are creatures, and they are there as tutors to bring us to revelation of who God is and of His ways. We need to engage them and learn from them if we are to be revealed as the sons of God. 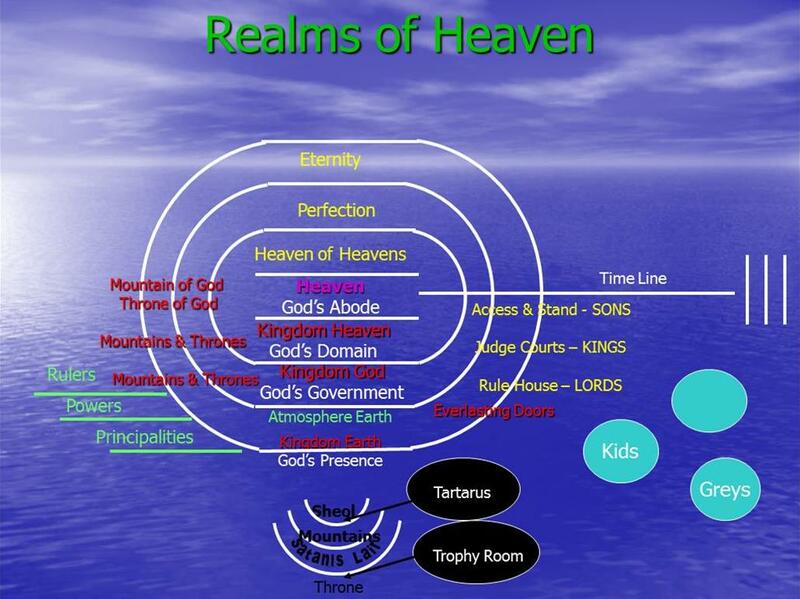 This is another view of the realms of heaven, based on Ian Clayton‘s ‘menorah’ diagrams. 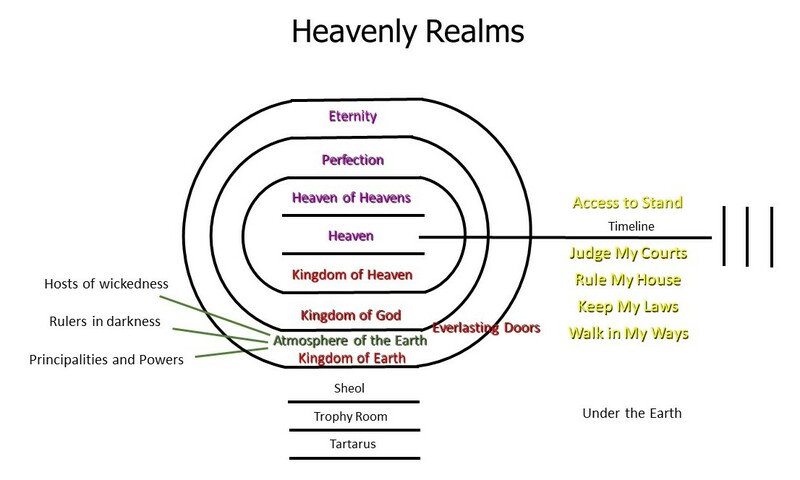 You can see how these realms of authority in the heavens are arranged in the same way as the structure of the temple: Outer Courts, Inner Courts, Holy Place, Holy of Holies. There are protocols we can follow which will help us to access each of these. But if we want to get into the Holy Place and hear ‘Well done, good and faithful servant’, we need to fulfil our destiny. We each need to be able to rule as a lord, and a king, and to stand as a son. And we will be manifested as sons on the earth, just as God always intended. Engaging God on the Heavenly Pathways of Relationship and Responsibility is our online school for equipping a Joshua Generation of supernatural sons of God to live according to the order of Melchizedek. Your first two weeks free! Get started today* or find out more.